One matchless treasure held by the Hungarian National Museum is the mantle that was worn by Hungarian monarchs at their coronation. This mantle was created in 1031 at the request of King Stephen I (St. Stephen of Hungary) and his wife Gisela of Bavaria. The mantle was originally a bell-shaped, one-piece chasuble (conical) that was later altered into a mantle. According to the inscription embroidered on it, the chasuble was made on the instructions of King Stephen I (r. 997–1038) and his consort Gisela. In 1031 they presented it to the Church of the Virgin Mary in Székesfehérvár, Hungary: ANNO INCARNACIONIS XPI : MXXXI : INDICCIONE : XIIII A STEPHANO REGE ET GISLA REGINA CASULA HEC OPERATA ET DATA ECCLESIÆ SANCTA MARIÆ SITÆ IN CIVITATE ALBA. The ground fabric is rosette-patterned Byzantine silk which is covered almost entirely with ornamental embroidery using gold thread. On the back of the mantle is a Y-shaped (St. Andrew) cross. The raised arms of this cross feature half-length depictions of angels, while the vertical element shows two depictions of Christ, one underneath the other. In the upper one, Christ is shown as the conqueror of death with His feet on two dragons; in the lower one, He sits on His throne as judge of the world. The rest of the decoration is organized into bands: above are shown Old Testament prophets while below them, separated by the presentation inscription, sit the Apostles in richly worked tower-shaped niches. Below the Apostles are the first martyrs, shown in circular medallions. The martyrs are separated by pairings of birds. Between them, at the foot of the cross, is a depiction of the royal couple who made the presentation, accompanied by an inscription. 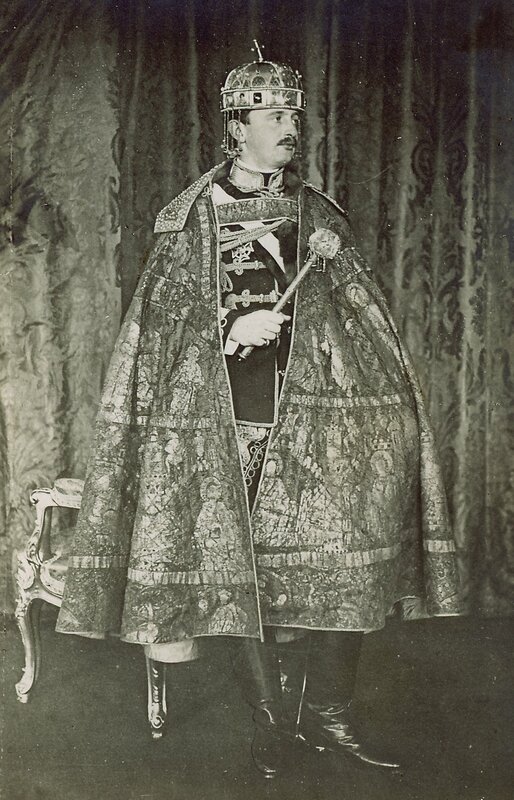 The Hungarian Coronation Mantle was used in the coronation of Kings for 885 years from 1031 to 1916. The mantle is housed in the Hungarian National Museum, Budapest. Photo by the Hungarian National Museum. 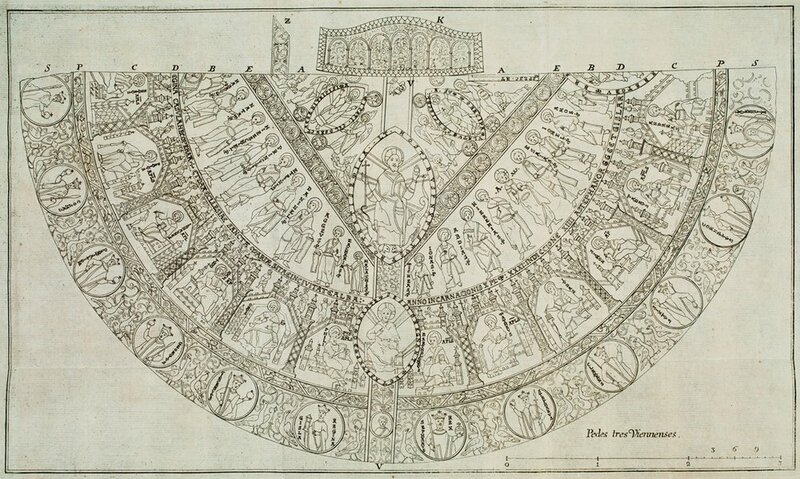 This illustration of the Hungarian Coronation Mantle is taken from Ferenc Balassa’s 1754 dissertation. For more information on this illustration and the mantle's research, visit Princeton University Library. When the alteration was made, a broad strip was cut from the chest part of the chasuble, and of the square-framed and mandorla-framed scenes only small parts remain (a mandorla is an oval-shaped halo: in the depictions, the figures of Jesus, Mary, and the saints all have one). The ample inscriptions on the mantle contain on the one hand the names of the figures and on the other hand explanatory Latin texts in hexameters embroidered onto the frames. The mantle also depicts figures from the Te Deum, one of the best-known hymns of the medieval period: the angelic host, prophets, Apostles, and saints named in the hymn are depicted in rows. The chasuble may have been altered around the turn of the 13th century, when long, sleeveless mantles became fashionable. It was then that the garment was given its collar, which likewise consists of a Byzantine silk ground embroidered with gold thread; it is ornamented with arcading animal figures with pearls set into it. Similarly to the mantle, the collar, was originally a part of ecclesiastical attire. 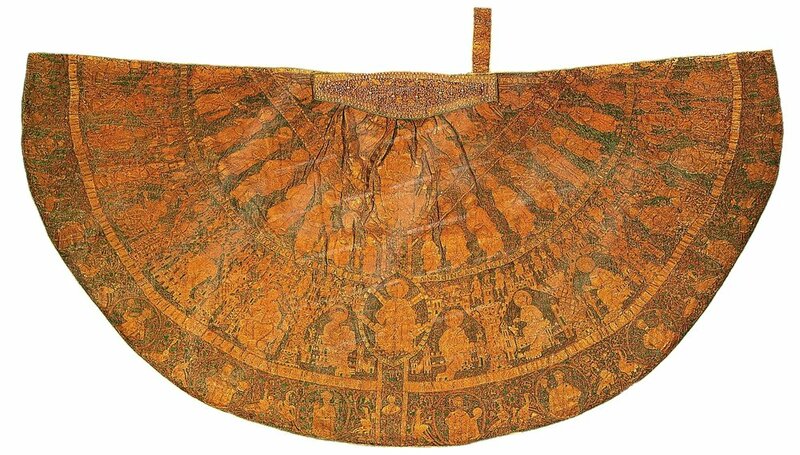 It was embroidered in the second half of the 12th century. The first datum in which the mantle is featured is a record related to the coronation of King Andrew III of Hungary (r. 1290–1301). According to it, "The king was in attire such as St. Stephen wore earlier on." Text borrowed from the Hungarian National Museum.